You can volunteer your time to help Teeth Relief directly or to help other organisations. If you have an idea about a document that could be created that might be useful then please let us know. Offers of help to produce educational resources are welcome. Should you have come across teaching materials that we might be able to get permission to put on our website then that would be helpful too. The location of teaching resources on the internet that we can signpost would also be useful. 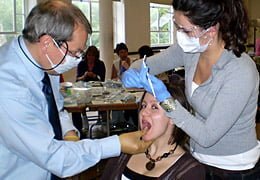 We deliver oral health awareness training for general nurses and doctors at LSHTM. We need dentists to volunteer to help with this training for which you will get CPD. Before the session you undertake to read the Teeth Relief Training Manual and trainer notes. Then attend the 3 hour session and help to teach a group of students. Afterwards, complete a feedback and evaluation form. Email info@teethrelief.org.uk with your details and we’ll get back to you with session dates.